What is the Crown Jewel Defense? The Crown Jewel Defense strategy in mergers and acquisitionsMergers Acquisitions M&A ProcessThis guide takes you through all the steps in the M&A process. Learn how mergers and acquisitions and deals are completed. 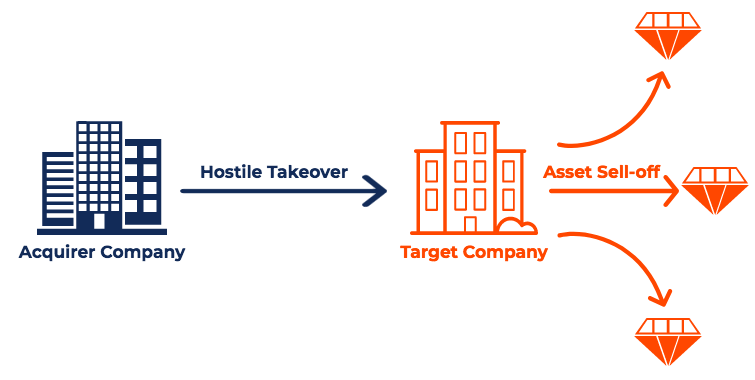 In this guide, we'll outline the acquisition process from start to finish, the various types of acquirers (strategic vs. financial buys), the importance of synergies, and transaction costs (M&A) is when the target company of a hostile takeover sells its most valuable assetsTypes of AssetsCommon types of assets include: current, non-current, physical, intangible, operating and non-operating. Correctly identifying and classifying the types of assets is critical to the survival of a company, specifically its solvency and risk. An asset is a resource controlled by a company which future economic benefit to reduce its attractiveness to the hostile bidder. In other words, the crown jewel defense is a last-resort strategy since the target company will be intentionally divesting it’s most valuable assets and destroying value with the hopes the acquirer drops its hostile bid. Learn more takeover terms in CFI’s M&A GlossaryM&A GlossaryCFI's M&A Glossary of terms and definitions for mergers & acquisitions transactions. Terms are from CFI's advanced financial modeling course, M&A modeling. To fully understand the crown jewel defense strategy, it is important to know what a crown jewel is. Crown jewels are the most profitable or valuable corporate units or assets that belong to the company. In essence, crown jewels are the company’s most prized or valuable assets in terms of profitabilityProfitability RatiosProfitability ratios are financial metrics used by analysts and investors to measure and evaluate the ability of a company to generate income (profit) relative to revenue, balance sheet assets, operating costs, and shareholders' equity during a specific period of time. They show how well a company utilizes its assets, future business prospects, and asset valueNet Identifiable AssetsNet Identifiable Assets consist of assets acquired from a company whose value can be measured, used in M&A for Goodwill and Purchase Price Allocation PPA. A company’s crown jewels depend on the industry and nature of the business. For example, a company that operates in the automobile industry as a manufacturer may consider its crown jewels the production and manufacturing factories it uses. Company A makes a bid to purchase Company B. Company B rejects the bid. Company A pursues the acquisition anyway by offering to buy shares of Company B at a 10% premium. Company B, fearing that Company A may be successful in achieving a majority interest in the company through share purchases, decides to intentionally destroy company value by selling valuable assets. Since the most valuable assets of the company are gone, Company A retracts its bid for Company B. In a crown jewel defense, the target company sells off its most valuable assets to reduce its attractiveness. Notice that in a crown jewel defense, the target company is essentially destroying value and killing the company to prevent it from being acquired. Recall that in a crown jewel defense, the target company sells its most valuable assets to a third party. However, in a lot of cases, the target company will sell its most valuable assets to a friendly third-party (a white knightWhite KnightA white knight is a company or an individual that acquires a target company that is close to being taken over by a black knight. A white knight takeover is the preferred option to a hostile takeover by the black knight as white knights make a 'friendly acquisition' by generally preserving the current management team). When the hostile bidder drops its bid, the target company will purchase back these assets from the friendly third party at a predetermined price. Therefore, a crown jewel defense does not always destroy the target company. In the previous example, Company B sold its most valuable assets to a random third party, thus destroying the company. Let us consider a more optimized crown jewel defense strategy in which Company B sells its assets to a friendly third party. Company A pursues the acquisition anyways by offering to buy shares of Company B at a 10% premium. Company B reaches out to a friendly company – Company C – to purchase Company B’s assets for $100 million. Company B and Company C sign an agreement that Company B will purchase back its assets at a slight premium once the hostile bidder is gone. Since the most valuable assets of Company B are gone, Company A retracts its hostile bid. With the hostile bidder gone, Company B repurchases its assets from Company C at the predetermined price. There is often the misconception that a crown jewel defense strategy is essentially a company killing itself. In the example above, we showed that a better crown jewel defense strategy would be to sell off assets to a friendly third party and buy back the assets after the hostile bidder abandons the strategy. To learn more, read CFI’s M&A GlossaryM&A GlossaryCFI's M&A Glossary of terms and definitions for mergers & acquisitions transactions. Terms are from CFI's advanced financial modeling course, M&A modeling. CFI is a global provider of financial modeling training and financial analyst certification programs. To continue learning and advancing your career, these additional M&A related resources will be helpful.